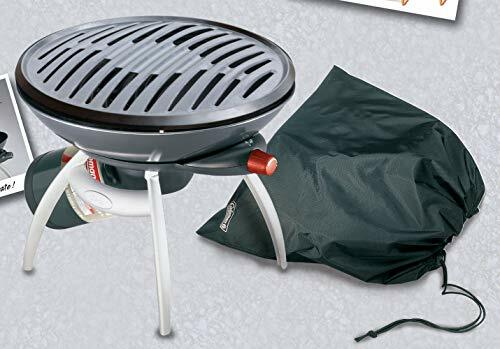 If you like to camp, tailgate, or cookout when you go to the beach, then you are likely trying to wade through a sea of portable grill options. Figuring out which one is right for you can be a headache that continues with every new click. One of the best ways to weed out your options is to stick with tried and true names. The last thing you want is to sink your hard earned money into some fly by night brand, only to find out that the “Captain Sizzle” grill just isn’t up to snuff. With that in mind, one of the most reliable names in the grill industry is Coleman. They are an American made company that has been in business selling propane lanterns, grills, and other appliances since 1900. 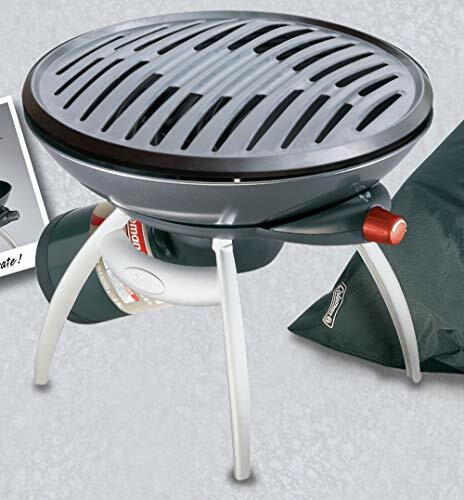 The Coleman Party Propane grill was designed to be compact, and easy to move. It rings in at just under 6-pounds. Its single propane burner produces 8,000 BTUs of heat. It was designed with Coleman’s PerfectFlow technology. This helps it produce even heat while also reducing problems with wind blowing out the flame. It includes an Insta-start igniter which fires up the propane burner with the press of a button. The Coleman Party gas grill is only set up to run on a 1-pound propane canister. Throughout Coleman’s entire product line, they try to balance quality with affordability. You see this echoed in their Party grill. 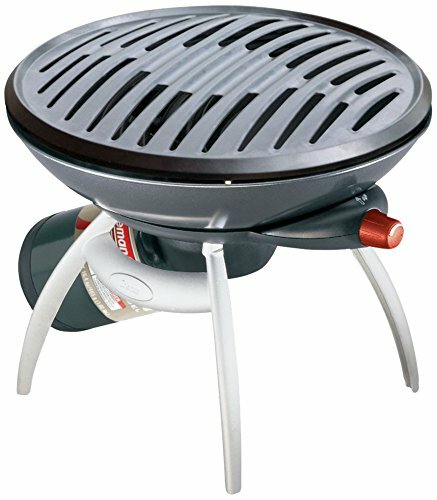 Taken in this light it would be hard to find another portable gas grill with higher quality materials, for a lower price. 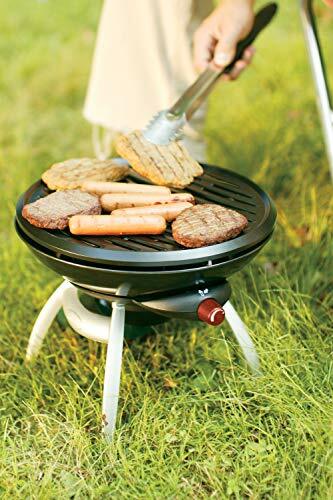 When it comes to assembly, it was designed with the convenience of a portable grill. Straight out of the box, you should be able to put it together in a little over 10-minutes. Save some of the internal packing material so you can easily take it with you in its own box. The Coleman Party Grill isn’t the largest gas grill on the market. If you want something that can grill up a pair of porterhouse steaks on the back of a pickup truck’s tailgate, you are going to want to look for something larger. If you want to be able to grill up a mess of hot dogs, or enough hamburger patties to feed you and your buddy, the Coleman Party grill will take care of you. 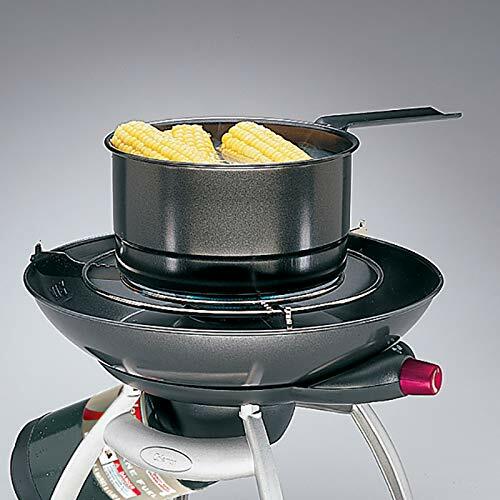 It’s even big enough to handle a modest pot of water to say boil corn, or a pan to fry up some breakfast. If you do want to pan fry something over the Party grill’s propane flame, it’s best to use a bottom clad or a cast iron frying pan. Give the metal a solid ten minutes for the 8,000 BTU flame to fully heat the metal. At that point, you will have enough heat to fry bacon, or even saute vegetables for fajitas. Just keep in mind that grill grate is slightly convex. This might make a pot or pan feel a little wobbly. In a pinch, you can make two small balls of heavy duty aluminum foil to help hold the pan stable. Coleman also sells accessory pan rings through various online retailers at a very reasonable price. As time goes on the vulnerable semi-nonstick coating can start to break down. Especially if you are using it as a burner to heat pots and pans. 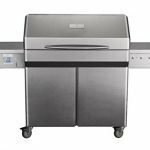 If you find the grill grate is starting to stick to foods a lot, you might try lightly greasing it with an oil-soaked paper towel before you place the food directly on the grate. If you prefer Coleman does sell replacement grates on their website and through other online retailers for a very affordable price. 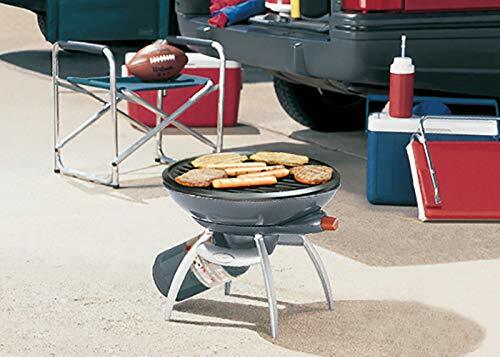 The grill grate for the Coleman Party provides 122 square inches of cooking space. The InstaStart igniter allows you to fire up the grill with the simple push of a button. The PerfectFlow Technology of the design helps to reduce problems with the wind blowing out the flame. It also helps to redistribute the heat for a more consistent cooking surface. The Coleman Party gas grill was designed to be easy to clean. The grilling surface is specially coated to allow you to clean it in the dishwasher. If you are at camp or away from home, you can gently wipe it down with a clean paper towel or rag. A nylon grill brush should be able to scrape away any stuck-on material. You can then slip the grill grate in a large plastic bag to pack it away. When you get home, the grate is dishwasher safe, making it very easy to clean. As time goes on it’s natural for the semi-nonstick coating to degrade a little. Using silicone or nylon coated grill tools will help prevent damage to the grill grate’s surface. The original box is ideal for storing the grill away. Save the structural packing materials, and you box it up nice and neat to store it away in a cupboard when you aren’t using it. The Coleman Party gas grill comes with a three-year limited warranty. 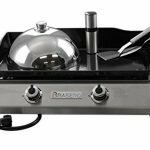 This is a big step further than you will find with pretty much every other portable gas grill of this size and price tag. There are a few limitations in the warranty if the grill isn’t cared for properly. So, make sure to read all the fine print, and register your gas grill as soon as possible. There are also some online retailers who offer an affordable three or four-year protection plan for many of the parts that might not be included in the three-year limited warranty. Finding the right portable gas grill can sometimes be a challenge. There are certainly a lot of options out there to consider. Starting off by looking at the Coleman brand first, is one of the best ways to buffer yourself against manufacturer short cuts.